We’re a little over halfway through the year, which means we’ve seen a number of cool and unexpected trends rise up the ranks (hello, cowboy boots and seashells!). And in the middle of wedding season, we’ve noticed one major trend from the past months: 2018 is the year of unique engagement ring settings. In fact, more couples are opting for nontraditional rings than ever before, according to Jenny Chung Seeger, founder of San Francisco jewelry boutique No. 3 and customizable engagement ring platform Waant. 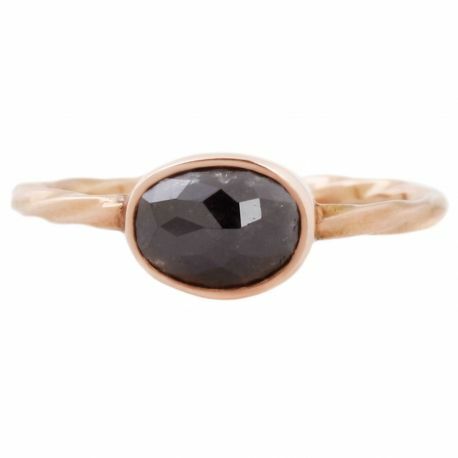 “70% of our engagement rings sold on Waant are made with alternative stones,” says Seeger. Along with unique stones, the jeweler mentioned the rise of mixed metal rings, clusters, and interlocking (also known as double-band rings) among other unique styles for nontraditional brides. Whether you’re planning on dropping a few hints to your S.O. soon or are just browsing for the fun of it, see the most popular unique ring styles brides are choosing this year. According to Seeger, setting a nontraditional stone can make a classic setting feel way more personal and unique. You’ll look so cool with this on your finger. So many couples are loving sapphire rings. “Typically halos are thought to be a traditional style, and not many modern brides take this direction, but the new proportions of the halo have become increasingly popular,” Seeger shares. We can’t get over this shape. “A lot of modern brides are bucking the traditional stacking of the wedding band below the engagement ring and opting for an interlocking set instead,” says Seeger. Wear your wedding band in the middle for a unique stacked approach. Wear this with your wedding band after the wedding. Available in sizes 5 to 7.5. This ring is a conversation starter. Seeger says, “We have a lot of clients who dream of setting their engagement ring in rose gold but worry about the timelessness of the pink metal.” If you’re still not sure, Seeger says lots of her brides opt for mixed-metal rings. Two trends in one ring. Talk about a unique shape. This ring will never go out of style. Instead of one large stone, many couples are doing an arrangement of diamonds and other gemstones to create an engagement ring, according to Seeger. She says this allows couples to have pops of color without the full commitment of a colored center stone. You won’t be able to stop staring at this ring. Now this is a unique engagement ring. We love how simple this ring is. We’ll be saving these to our Pinterest boards for when the big question comes.